Antioch University’s PhD in Leadership alumnus and Chief Community Impact Officer at United Way of Central Indiana, Dr. Kiko Suarez has been selected by the Indianapolis Colts to be recognized and to receive a 2018 Hispanic Heritage Leadership Award. Learn more about Dr. Suarez and his work here! Antioch University’s PhD in Leadership and Change program alumna Dr. Karen Gilliam has been selected to serve as the National Aeronautics and Space Administration (NASA) Chief Learning Officer and Organization Development Capability Lead. Additionally, Dr. Gilliam recently obtained the Associate Certified Coaches credential from the International Coach Federation (ICF). The Associate Certified Coach (ICF) is the first level of an ICF Credential. Watch this video to learn more about Dr. Gilliam and her work! Antioch University’s Graduate School of Change Professor of Leadership and Ethics, Dr. Donna Ladkin is a plenary speaker at this year’s International Leadership Association (ILA) 20th Anniversary Global Conference in West Palm Beach, Florida. Dr. Ladkin’s keynote entitled, “Why Self-Constitution Trumps the True Self as the Foundation for Leading Authentically” will introduce the possibility of authenticity as emerging from deliberate processes of self-questioning and reflexivity, as well as sensitivity to the context in which one is operating. Watch Dr. Ladkin’s keynote here! PhD in Leadership and Change (PhDLC) program alumnus, Principal for Creative Community Builders, and Director of Graduate Studies for The University of Minnesota’s College of Continuing Education Dr. Tom Borrup was the keynote speaker for the Gwangju Urban Design Forum in Korea and published the chapter entitled, “Creative Placemaking: Arts and Culture as a Partner in Community Revitalization” in Arts and Cultural Management (Bloomsbury Academic, 2017). Dr. Borrup also recently published “Can Cultural Planning Help Build More Equitable Cities?” for Grantmakers in the Arts the only national association of both public and private arts and culture funders in the United States. Dr. Borrup also recently collaborated with fellow PhDLC alumnus Dr. Tom Ellison planning project to designate and build social and civic infrastructure for a Creative Industry Zone in Utah. Learn more about their work here! The Antioch University PhD in Leadership and Change (PhDLC) was approved by the Peace Corps as a Coverdell Fellows Program in 2016. We are one of very few doctoral-level programs with this distinction. This partnership honors the service of Returned Peace Corps Volunteers (RPCV) and encourages them to bring their commitment back home to serve communities in the United States. In other words, to do action that makes our democracy more just and stronger! This partnership also reflects our University’s historic legacy to provide education that ‘wins victories for humanity.’ As well, the partnership reflects Antioch’s long-standing relationship with the Peace Corps, including our very own Al Guskin’s role in the founding of the Corps back in the 1960s! Coverdell Fellows (CF), who must be Returned Peace Corps Volunteers, receive a significant tuition waiver for the first three pre-candidacy years in the PhD in Leadership and Change program, assuming good academic progress. In return, Fellows are required to do the program’s Change Project in/with an underserved community in the United States (a Peace Corps requirement) and to complete it during the second year in the program (PhDLC requirement). To date, we have two Coverdell Fellows; Both Helen Lowman and JJ DiBella entered the PhDLC in 2016 and are now completing their second year. Consistent with the Fellows’ requirements, both designed, implemented and reflected on their Change Projects during AY 2016-17. We are so proud of the work they have done to serve communities in the United States through these projects. We interviewed our two Coverdell Fellows about their learning, experience, and impact. AU: Please briefly describe your project and its purposes. What did you set out to do? HL: Through a better understanding of how underserved communities feel about preparing for disasters, the results of this project’s needs assessment have the potential to impact communities across the United States, and may change the way FEMA preparedness programs collaborate with underserved populations, potentially saving lives in our nation’s communities most likely to be adversely affected by disaster. JD: My change project set out to work with leaders to respond to an expressed need from employees at different levels of the National Park Service (NPS) to further promote the development of intercultural competence in the NPS. The goal with approximately 30 NPS leaders; was to take the Intercultural Development Inventory (IDI); reflect on personal and group results; commit to relevant actions to support culture change, and give feedback on the efficacy of using the IDI on a larger scale. The project’s premise was that building even stronger intercultural competence in agency leaders will engender more inclusive, employee-centered work environments. AU: Can you reflect on your learning as both leader and learner as a result of this project? HL: First, I wanted to gain a greater understanding of underserved communities in the United States. What surprised me most about this goal was how much I would learn about communicating with underserved communities, how interesting the results were and how ignorant I was prior to this project. I also learned to think differently about national messaging or marketing campaigns. The lesson here is that there is no single message that will inspire cognitive behavior change in every American. Messaging must be adapted to the community for it to be absorbed and acted upon. While the messaging that FEMA is producing is good and has made an enormous impact on the lives of Americans, it is only slowly reaching Americans who historically have been forgotten. I am sure this was never the intent of anyone working at FEMA. Now that I have been a part of this needs assessment, I will be able to guide teams to develop tools and resources that are more targeted and intentional in their outcome. JD: My career at the Peace Corps ingrained in me a staunch belief that if you are trying to make sustainable change you must work together with those around you to define and implement the change. The change process is a dance involving a multitude of learning and change strategies that metaphorically requires both the letting go and bringing in of new steps and music. I have found this approach more difficult from a position of senior leadership in a hierarchical organization than my former position as a consultant in a flatter organization. While my role as a senior leader gives me access to all levels of leaders, the decentralized nature of the organization can make it difficult to learn what is going on at the field level. To mitigate that, I try to ask lots of questions of staff in different locations and career fields and listen closely to what is said both directly and indirectly. The project really made me think about race, privilege, marginalization, and leadership. For too long minority groups have been looked toward to educate the majority group about the minority instead of members of the majority groups teaching each other how to be more interculturally competent. This is the same realization I had when serving in the Peace Corps and working with groups where I was in the minority. I’ve learned that I can be very effective, maybe even more so as a member of the majority group, educating others in the majority group. AU: What do you see as potential implications for the field, in essence how your change project informs practice? HL: The FEMA team I worked with rated “Targeting programs to underserved communities” as the number one opportunity. Subsequently, their new three-year strategic plan has several goals and objectives that will drive them to realize this vision. There are many simple steps that can be taken by emergency management professionals to adapt their preparedness messaging for underserved communities, making them more equitable and inclusive. However, these changes and initiatives will take intentional effort and specific adaptation to reach individuals and communities unable to prepare with traditional preparedness messaging. Leaders who oversee disaster preparedness programming and promotional campaigns must ensure steps are taken at every turn to remind their staff of the imperative to reach all audiences and communities, not only those who have the ability and access to general messaging. Additionally, inclusive planning and community-level policy-making strategies can strengthen relations, creating a venue for public officials to educate the local population and build community capacity to acquire knowledge about local hazards and future disaster risks and how to prepare, cope with, and recover from disasters. The resiliency of the United States is dependent upon the preparedness of historically underserved communities. JD: My biggest personal learning from the project at NPS, is the importance of individuals from the majority culture working to educate others in the majority culture. While individuals from the minority culture have a role to play as well, individuals from majority cultures need to work to make change within their own group. The two groups I worked with for my change project were much more representative of the minority groups within the organization than the majority groups. I am continuing with the work started during my change project in the coming months and will be curious to learn how different groups respond to the IDI. The PhD in Leadership and Change community invites individuals interested in learning more about the program to join us for an inquiry visit to meet faculty, staff, students and alumni! Leslee Creighton (lcreighton@antioch.edu or 877-800-9466) for further details and to confirm attendance. Program student, Annie Hernandez, has been named Director of Youth Philanthropy for the Frieda C. Fox Family Foundation out of Los Angeles leading its national network Youth Philanthropy Connect. Hernandez joined the staff of the Frieda C. Fox Family Foundation in 2012. She has served in a variety of public and not-for-profit capacities including a nonprofit management support organization, the State of Indiana’s Rural Affairs, faculty of the J.W. Fanning Institute for Leadership at the University of Georgia working with the Community Leadership Association, and as the inaugural Executive Director of Fiesta Indianapolis, Inc. Additionally, Hernandez has been recognized with the inaugural Young and Emerging Capacity Builder Award from the Alliance for Nonprofit Management and was Indiana’s delegate to their Nonprofit Congress in 2005. Hernandez earned her Master of Science in Agricultural, Environmental Communication, and Education at the University of Illinois, and her Bachelor of Science from Texas A&M University. Program alumna, Dr. Karen Gilliam has accepted the position of Manager for Organization and Employee Development within the Human Capital Development Division of the National Aeronautics and Space Administration’s (NASA) Glenn Research Center. Learn more about Dr. Gilliam and her additional work as President of Gilliam Consulting here. Author, speaker, consultant, and PhD in Leadership and Change program alumnus Dr. Chip Espinoza is currently working on his second book, based on his dissertation, in which he presents challenges and suggestions for success for younger employees in the workplace. Dr. Espinoza was recently asked to be a content expert on millennials in the workplace for the Cable News Network (CNN) and is a contributing author for New Directions for Teaching and Learning: Interpersonal Boundaries in Teaching and Learning (Jossey-Bass, 2012). Dr. Espinoza’s first book, Managing the Millennials: Discover the Core Competencies for Managing Today’s Workforce (Wiley, 2010) was also based on his PhD program learning achievements. Learn more about Dr. Espinoza’s work here! Program alumna and Senior Organizational Development Consultant for Turner Broadcasting System, Inc., Dr. Cheryl Jordan, recently launched a new consulting practice focused on executive coaching, group and team facilitation, and organization change management. Learn more about Dr. Jordan and her work here. Continuing her amazing work to provide children with the tools to creatively express themselves, we proudly recognize program alum, Dr. Lucy Barbera, in her new role as Medical Art Therapist for the State University of New York (SUNY) Upstate Medical University at Golisano Children’s Hospital. Dr. Barbera recently curated, Masks of Hope and Healing, the first show of pediatric patient art since the hospital’s inception. Learn more about Dr. Barbera’s work here. Dr. Howard Kea recently completed a multi-year appointment to the North Atlantic Treaty Organization (NATO) Science for Peace and Security (SPS) program, Human and Societal Dynamics panel (HSD) and the Interdisciplinary Science Experts Group (ISEG). Learn more about the program here. Dr. Kea is currently Senior Organizational Development Consultant at the National Aeronautics and Space Administration (NASA) Goddard Space Flight Center. Learn more about Dr. Kea and his work here. Antioch University has hired a highly experienced enrollment manager to oversee efforts to attract and retain students that would benefit from the educational programming offered at the five Antioch University campuses nationwide. Charlotte Tullos, EdD, will assume the newly created position of Vice Chancellor for Enrollment Management and Marketing in January 2013. Dr. Tullos will come to Antioch University from the University of North Texas in Dallas, where she is completing her term as the interim Associate Provost for Student Success and Dean of Students through the Registry for College and University Presidents. In her current role, Tullos is responsible for strategic enrollment management, enrollment management systems, student retention research, student activities, and orientation. Dr. Tullos has a long and notable record in higher education student and enrollment services spanning over three decades. Prior to working for the Registry, She served as Vice President for Student Success and Vice President for Student Affairs and Enrollment Management at Central Washington University in Ellensburg, WA. Dr. Tullos also served in the roles of: Associate Professor of Counseling/Consultant, School of Education, Vice President for Institutional Advancement, Secretary for the University Foundation, and Vice President for Student Services at Henderson State University; Vice President for Student Development at Louisiana College; and Director of Career Planning and Placement, and Director of Student Orientation and Retention at the University of Southern Mississippi. She holds a BS, a MEd, and an EdD from the University of Southern Mississippi. “The reason I am excited about Antioch is because I have seen first hand the transformation of an Antioch University student – my own daughter – who has been given a new look on life through her experience at the University’s Seattle campus, from which she recently graduated. This attracted me to the University and I look forward to being part of the team,” Dr. Tullos said. The Vice Chancellor for Enrollment Management and Marketing at Antioch University will be a key member of the Chancellor’s Executive Team and take a leadership role, working with personnel at all five campuses to enhance the current systems used to gauge student recruitment, enrollment and retention patterns. Dr. Tullos will also lead efforts to craft and implement student enrollment strategies that will help attract and retain more students typically interested in the unique academic programs Antioch University offers. This will include the development of marketing strategies to be implemented system-wide and on each campus. “Charlotte is an enrollment management pro who understands the life-cycle of student engagement, and system implementation. She has a track record of developing structured recruitment programs that play to an institution’s strengths and lead to attracting additional students. We greatly look forward to seeing her take a leadership role in assisting our campus staff with recruitment and marketing strategies that successfully connect our offerings with potential students,” said Antioch University Chancellor Felice Nudelman. Find further details and University news here. The PhD in Leadership and Change program will be on campus at Antioch University Seattle in January and would like to welcome visitors to explore the curriculum, attend sessions, and meet members of our learning community! Please contact Leslee Creighton (lcreighton@antioch.edu or 877-800-9466) for further details and to confirm your attendance. Tom Borrup, program student and Principal at Creative Community Builders in Minneapolis, Minnesota recently presented Arteconomy Creates and Cultivates an Innovative Spirit that Generates Process – Product Innovation and Artworks at the Artist, Enterprise, and Industrial Complex symposium in Seoul, South Korea. Borrup blogs about his experience in Seoul as part of a larger initiative to innovate and transform South Korea’s old industrial spaces. Read his blog entry here! Learn more about Borrup’s work here! PhD in Leadership and Change program alumna, Dr. Laura Santana recently designed, delivered, and implemented a leadership development and team building initiative with micro-finance leaders in Bogota, Columbia. The financiers serve underserved populations and seek to democratize lending practices in this region of Latin America. PhD in Leadership and Change program student, Tom Ellison was recently elected Chair of the Board of Trustees for Westminster College. A graduate of Yale University and the University of Utah College of Law, Ellison is Partner at Stoel Rives, LLP, Attorneys at Law in Salt Lake City, Utah where he specializes in real estate, land use and development services. PhD in Leadership and Change program alumnae, Dr. Kate “O’Neill, will lead upcoming international workforce development workshops focused on cross-cultural leadership and organization development at the Training Development Show in Dubai. Dr. O’Neill is currently an Assistant Professor of Business Communication at Zayed University specializing in leadership change, organizational behavior, and adult education. Professor of Human Development and Indigenous Studies, Dr. Carolyn Kenny, will chair the Education Symposium on Indigenous Leadership co-sponsored by The University of British Columbia’s Educational Studies graduate program in Educational Administration and Leadership and the Indigenous Education Institute of Canada. \Visit Dr. Kenny’s bio page to learn more about her work. The PhD in Leadership and Change program celebrates the success and recent appointment of student Tami France to Human Resource Partner with the Mayo Clinic. Former Regional Human Resources Manager for Accor Luxury Hotels and Resorts in China, France specializes in international human relations, cross-cultural leadership, expatriate management, and corporate social responsibility initiatives. In her new role with the Mayo Clinic, France will work in leading the Human Resources team to support innovative research and care through the organization worldwide. Owner-Facilitator for Rapport Consensus Planning and PhD in Leadership and Change program student, Norman Dale, is currently working with Lheidli Tenneh, a native First Nation in central British Columbia, to help the community resume dialogue about a proposed treaty with the federal and provincial governments. Dale specializes in mediation, community economic planning, collaborative planning, and cross-cultural reconciliation. Learn more about his efforts here. Program graduate, Dr. Peter Dickens has been appointed Executive Director of the Open Learning Centre at Tyndale University College and Seminary in Toronto, as well as the Director of the Centre for Leadership at Tyndale. In these new roles, Dickens will develop and market a host of executive development programs and consulting services, and will lead continuing education strategies for the University. This year is the 225th anniversary of the signing of the Constitution of the United States of America. September 17th commemorates the day in 1787 when thirty-nine delegates to the Philadelphia Convention signed the U.S. Constitution. All members of our PhD community are invited to have appreciation for, to reflect upon, and to have dialog about the significance and impact this historical document has on our lives. Please feel free to visit the websites below for information and resources about the Constitution. YELLOW SPRING, OHâ€• August 21, 2012â€• Antioch University graduate, Ronnie Hagerty was recently appointed as one of six members to the OneStar National Service Commission, by Texas Governor Rick Perry. The commission and the OneStar Foundation work together to further national service initiatives in Texas and to administer the AmeriCorps Texas program. Veronica “Ronnie” Hagerty of Houston is assistant vice president of community relations for the United Way of Greater Houston. She is a board member of the Association of Fundraising Professionals and ESCAPE Family Resource Center, a credentialed member of Certified Fund Raising Executives International, and a sustaining member of the Junior League of Houston. She is a past board member and past chair of the Texas Nonprofit Management Assistance Network and Texas Health and Human Services Commission Renewing Our Communities Account Advisory Committee, and a past board member of the Houston Chapter of the American Diabetes Association and Women’s Resource of Greater Houston. Hagerty received a bachelor’s degree from St. Mary’s College at Notre Dame, a Master of Business Administration from the University of Houston Graduate School of Business. Dr. Hagerty earned her PhD in Leadership and Change from Antioch University. Her study focused on the the changing landscape of philanthropy in the Houston area as a result of the Great Recession. The PhD in Leadership and Change program is dedicated to the study, research and practice of leading change that wins victories for humanity, large and small. It develops in its students the knowledge, skills and habits of mind to engage in change that betters workplaces, schools and communities across the country and globe. 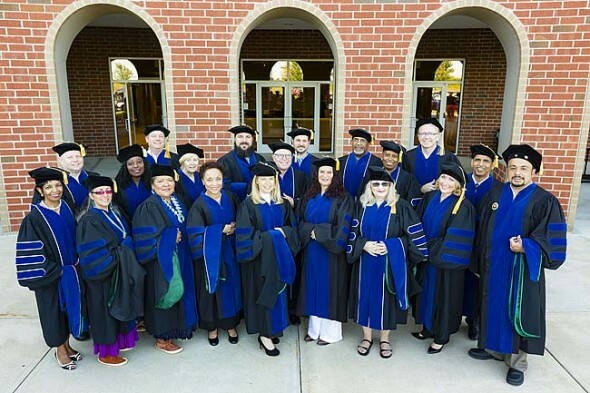 By Megan Bachman – For the 18 graduates from Antioch University’s Leadership and Change Ph.D. program, the degree was far more than an academic accomplishment. At Saturday’s commencement, graduates talked of “achieving a lifelong dream,” and called the degree “one of the biggest accomplishments of my life” as they concluded a doctoral program that few actually needed for career advancement, but that many chose to undertake in order to expand their knowledge and become better leaders in their life and work. In its 10th year, the unique program, suffused with the values of Antioch – including social justice, practical application and academic rigor – continues to draw top students from around the nation and make a name for itself as a pioneer in the field. “The Ph.D. has at least tripled my perspective on the work of leadership development and organizational change,” said Martha Miser, a 2011 graduate of the program who came to commencement from her home in Boston. Miser was the global head of leadership and change for ING Bank before she started the program, and craved to bring a social justice perspective on leadership to the corporate world. “The program made me more socially conscious and I was able to bring that into the work I do know,” said Miser, who completed a thesis that challenged the assumption of economic growth. While Harvard’s leadership program recommends that students not work while in their program and, in admitting students, prioritizes test scores over work experience, Antioch honors the skills of practitioners and encourages the application of theory, Miser said. Laurien Alexandre, the program director, explained this difference at an information session for prospective students last week. For example, Julie Johnson, who graduated on Saturday, studied museum leadership while at the same time working at a science museum in St. Paul, Minn.
“[The program] acknowledges that practitioners have knowledge that’s useful as a place to start rather than telling us to forget everything that we know,” she said. Johnson, who completed a thesis on museum leadership, has already been asked to join the faculty at a Getty Leadership Institute program for museum leaders. This year’s graduating class represented a broad array of fields, from education and nonprofit organizations to the business world and military. Colonel Brent French, a military reservist, said he almost quit the program when he was deployed to Afghanistan two years ago, but ended up using it as an opportunity to complete a thesis on the reentry experiences of military reservists. More than 100 people have graduated from the program, according to Alexandre, and the program has a far higher graduation rate than most doctoral programs. While a 50 percent graduation rate is typical, the Antioch program boasts a more than 75 percent graduation rate. Alexandre credits the low-residency model, where academic cohorts get together four times each year at different Antioch University campuses, in creating a strong learning community. There are also no grades, and no courses. Instead students demonstrate learning by completing assignments, also called “learning achievements.” The program is interdisciplinary, with 10 dedicated full-time faculty members in a variety of fields. And leadership theories tend to be broad, encompassing feminist theories and community-focused leadership as opposed to a fixation on the “executive leadership role,” Alexandre said. Dee Giffin Flaherty, a 2006 graduate who travelled from Pittsburgh to attend commencement, said she chose Antioch’s Ph.D. program because it was unlike other “Ph.D. programs in-a-box” and wasn’t about “jumping through hoops” to graduate. “You’re changing the world while you’re learning the scholarship of that change,” she said. The program is also quite diverse, Alexandre said. About 50 percent of the students in the program are people of color or international students. This year’s graduates hail from 12 states, Canada and the United Arab Emirates. Antioch University, headquartered in Yellow Springs, has five campuses across the nation delivering education for adult learners, including local campus Antioch University Midwest. PhD in Leadership and Change program student, Tom Crawford, has been accepted as faculty by the American Urologic Association and recently received an Excellence in Teaching Award from the University of Florida Society for Teaching Scholars for this contributions to resident physician education in the University of Florida College of Medicine. Learn more about this significant recognition here! in the Greater Miami Visitor Industry. The PhD in Leadership and Change program is proud to recognize student and Deputy Executive Officer at Mountains Recreation and Conservation Authority, Amy Lethbridge, who was recently elected President of the National Association for Interpretation (NAI). NAI is the largest professional interpretive association in the world, having almost 6,000 members who are park rangers, tour guides, docents, naturalists, and other professional communicators. Read more about NAI here! Antioch University’s PhD in Leadership and Change program alumna, Dr. Kara Malenfant, has been promoted to Senior Strategist for Special Initiatives at the Association of College and Research Libraries. The PhD in Leadership and Change program is proud to share the Winter/Spring 2012 issue of our newsletter, The Antiochian Leader. Find the full piece here. PhD in Leadership and Change program faculty each share thoughts regarding factors that brought them to Antioch University and highlight what makes our learning community so unique! Dr. Joye Jepson was recently recognized with fellow winners of the Science Technology Engineering and Mathematics Service and Legacy Awards from the Career Communications Group. Service Award winners represented a select group of past Black Engineer of the Year, Women of Color in Technology, Emerald Honors, and Career Communications Group volunteers who were acknowledged for their service as award presenters, 1-12 supporters, seminar speakers, committee members, and advisors. The PhD in Leadership and Change invites individuals to join us for a visit Saturday, May 19th at Antioch University Santa Barbara! Explore the program and meet members of our learning community. RSVP by May 14th for further details! PhD in Leadership and Change Program alum, Dr. Les Etienne, recently helped to make experiential learning come alive when joining forces with the “Seeds of Fire” Youth Organizing and Leadership Camp at the Highlander Research and Education Center. “Seeds of Fire” brings together a diverse group of Southern Appalachian teen activist/organizers and their adult allies and has served as a vital training center for labor, civil rights, economic and environmental justice organizers for over eight decades. To learn more about the center and their work here! PhD in Leadership and Change student, Tim Eklin, is the recipient of the Outstanding Student Paper Award from the Midwest Criminal Justice Association for his manuscript entitled, Leadership in Correctional Facilities. Eklin is Associate Dean of Education and Human Services at Baker College in Michigan. PhD in Leadership and Change program alum, Dr. Lynn Olsen, recently published “Leading Strategic Change” in Retail Info Systems News (RIS) magazine. View the full article here! On July 1, Antioch University will welcome its 5th chancellor. In a unanimous decision, the Antioch University Board of Governors has appointed Ms. Felice Nudelman to succeed Dr. Toni Murdock who announced her retirement last November.